Usually when I grill a steak, a nice grass fed ribeye generously sprinkled with sea salt and fresh ground pepper (grilled medium rare) is my steak of choice. Every once in a while you just want to add a little something to dress it up. 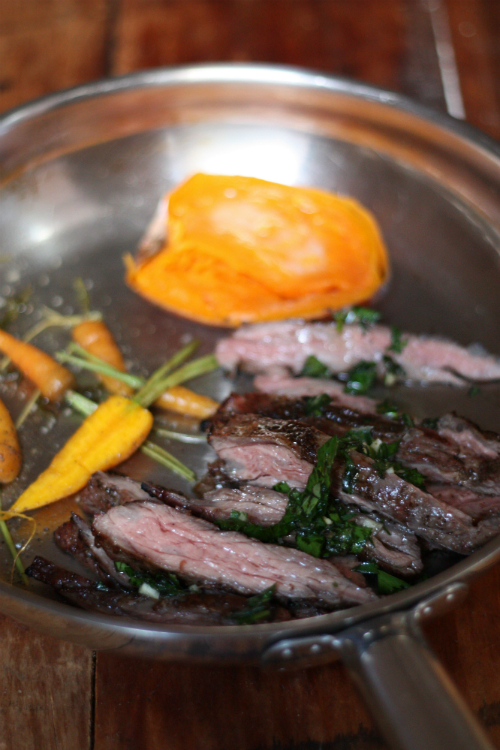 Sunday night it was a skirt steak with salsa verde, because our fresh herbs are coming up so well in the garden. 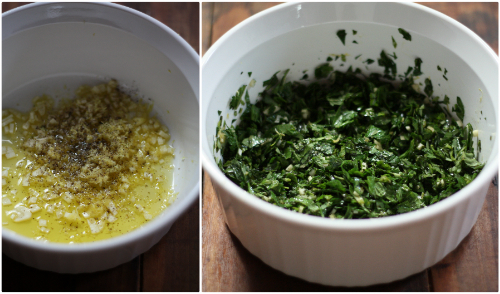 1 cup roughly chopped herbs — it's really about what you have. I used basil, tarragon, and mint from the E.A.T. garden. Then add 1 cup of Parsley, roughly chopped. Combine all of the above, mixing together and preparing 30 minutes before you prepare the steak. 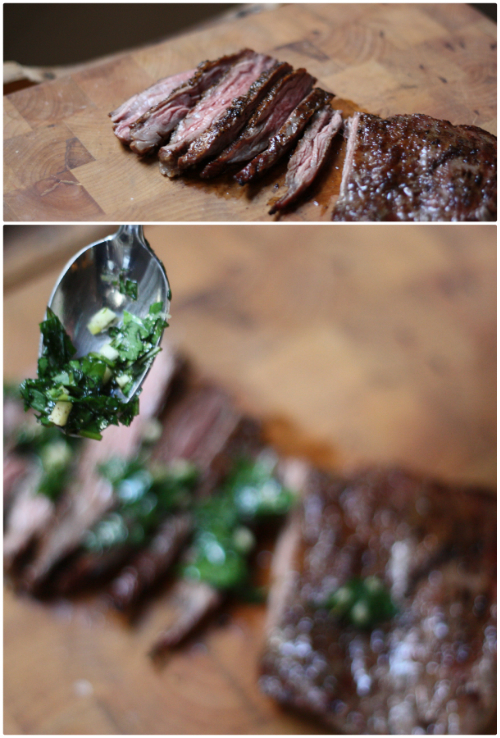 For this recipe I used about a 1 1/2 pound piece of skirt steak. If you are not familiar with this cut, it can be a little tough (I have never eaten one that was even close to tough) but is very flavorful — you'll see it used in stir fry's and asian dishes. Simply salt and pepper both sides before adding to a hot grill. This steak takes no time to cook — on a hot grill it takes all of 4 minutes per side to achieve medium rare (no other level of doneness is up to par for eating a steak in my opinion). Making sure you cut the steak across the grain — you add the salsa verde, passing more at the dinner table once served. You may notice the Tender Young Carrots in a Sage Butter, which I featured earlier this week making it's way into this spread. Also, sweet potatoes were again delivered in our Farm Table Box this past week, which is always a welcome side. I am afraid my plate (OK, I ate right out the skillet) resulted in the picture above as I finished my meal, leaning back completely satisfied. This meal takes no time to put together and your family will be pleased with the change from the normal grilled steak! 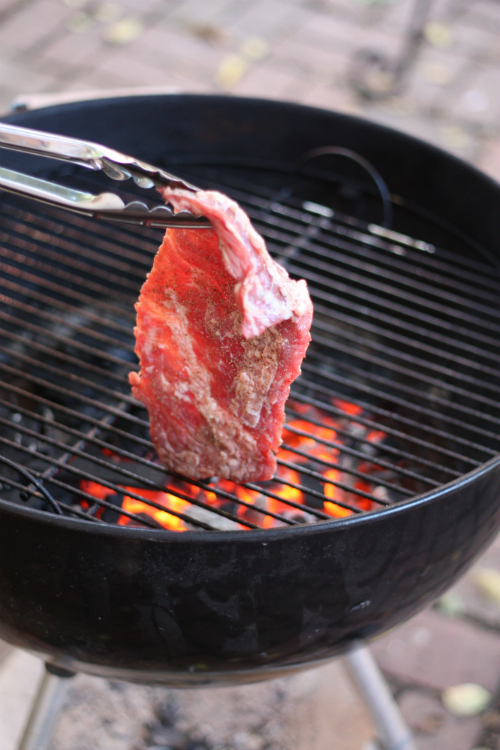 What is your favorite way to toss a steak on the grill? Do tell. Skirt steak is my favorite. It has such great flavor. The hardest part is letting the meat sit until you slice it. The aroma alone gets your mouth watering. I really wish that dish was sitting here in front of me right now. 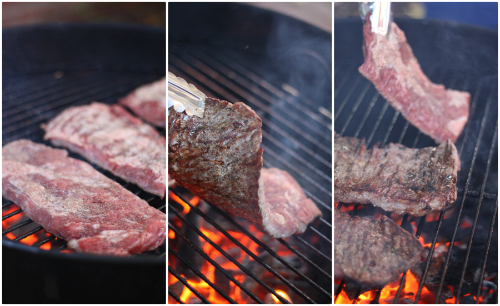 I love flank steaks wrapped into pinwheels and then put on the grill. oh I wish that was sitting in front of me right now. I love flank steak wrapped into pinwheels and then cooked on the grill. That's been my birthday dinner every year for probably the last 25 years. So sorry every time I post a steak recipe I do think of you in your beef desert. If I could ship you some I would. As always thanks for stopping by. That looks mouth watering delicious. I didn't use to serve my family much beef (cholesterol). Since learning about the healthier qualities of grass fed beef, I can now guiltlessly serve it. They love steak, so I am searching for grass fed steak recipes. I can't wait to try this one. That looks so fabulous, and I love that it looks as though you ate it right out of the pan. Perfect recipe for a Memorial Day cookout! Thanks Shannon burgers and smoked sausages for the cookout today but yes a great choice for Memorial day! Thanks for stopping by! Like your style of cooking Tim! I also often eat off the ribbed pan or off the barbecue! Small sharp knife and sea salt grinder close at hand!! Mmmm! Yes Archi agreed and beats having more dishes! Thanks for stopping by!